Yes, I was terrified of my daughter on day one. She was so sweet. She hugged everyone and had fabulous social skills. Since I had spent the past nine months or so immersed in the study of older child adoption, those were all red flags. Yes, the more adjusted she appeared the worse she probably was. She had not been diagnosed with Reactive Attachment Disorder (RAD) but I knew that we were going to hit attachment issues even in the best of situations. We spent the first few weeks with me spending every waking second with her. I teach school so even though I wasn't beside her, she knew I was there. I woke her up, chose her clothes, dressed her as you would a baby, I prepared her breakfast and then did her hair. After school we did things together and then when it was around 6:00 I had her get a shower. We then watched a little TV until 7:00 and then I got into bed with her. We read a book or watched TV or talked. I have to be honest that the attachment worked both ways. I had to fall in love with her. At first it was so difficult. Her heart was as hard as a rock. Yes, she smiled and giggled and had decent manners. But it wasn't real. I realized that when I heard her really laugh for the first time. It broke my heart that I had her fake laugh for weeks as real. We did laugh, and we still do. She used to say, "Make me laugh, Momma." And I try. Sometimes I have to say something shocking but she still laughs. We have attached. I even laugh at her sometimes. This picture was taken during her first few weeks at home. We did a lot of sidewalk chalk and she danced on a regular basis. 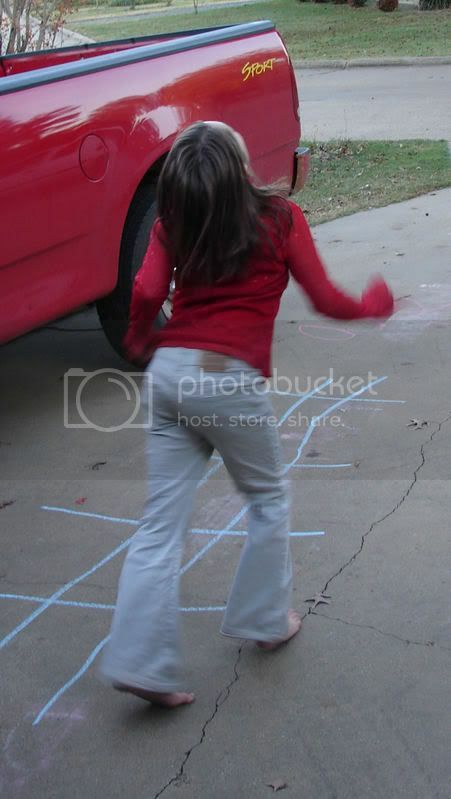 She's outgrown the chalk but still dances. I'm really loving these stories. Thanks for putting them on your blog! Someday I hope to adopt, and so I'm learning valuable things from what you are sharing. at first i thought my oldest had this disorder but now, she's totally opposite. like cling to my leg opposite.